The study area covers the areas of Lake Sonoma in California. The Sentinel 2 satellite imagery is pre-processed with the Semi Automatic Classiffication and QGIS 3 complements, to analyze the color combinations that allow obtaining the highlights of the study area. In the following image (left) we can see the representation of the image in natural color, product of the combination of the red, green and blue bands. Also, the composition in false color (right) and natural color (left) is observed. The natural color image involves the visible bands, while the false / infrared image represents the presence of vegetation better. The index widely used in vegetation monitoring is the Normalized Difference Vegetation Index (NDVI), which is the ratio of the near-infrared and red reflectance of the electromagnetic spectrum. However, vegetation indices based solely on visible reflectance are also used and using the RGB of a chamber area, called the Normalized Red-Green Difference Index (NGRDI). The absorption of chlorophyll in the red band and the relatively high reflectance of vegetation in the near infrared (NIR) band is used to calculate the NDVI. The monitoring of the intensity and density of vegetation growth can be done using the reflection of the red band and infrared band. 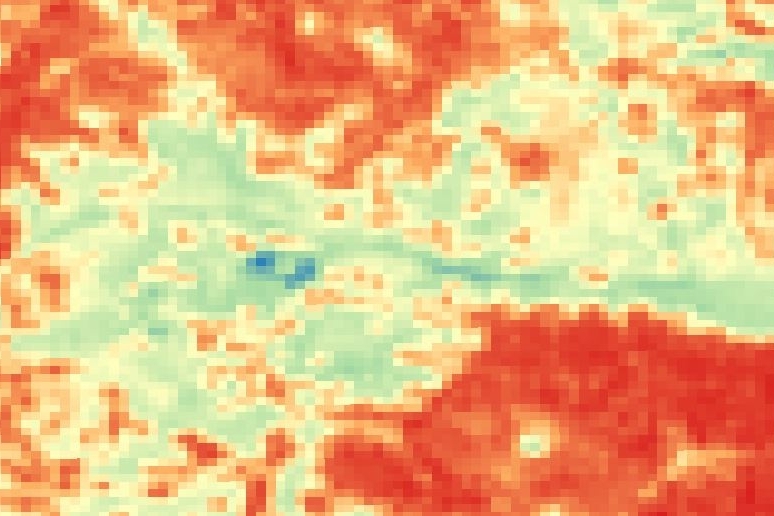 Green vegetation reflects more energy in the near infrared band than in the visible area. Next, the NDVI of the study area is observed, the image was obtained using the SCP's Bands Calculator tool. You can find more information on the calculation of the NDVI here. The NGRDI is obtained by calculating the reflectance of the green and red zone of the electromagnetic spectrum, which come from a true color image. This index can be used for the phenological monitoring of a crop that allows to determine the aerial biomass and the nutrient status for the weed management of a study area. However, visual vegetation indices are not applied as often as near-infrared indices, because of the difference in digital numbers between the green and red bands for vegetation and soil compared to the near infrared and red bands. Where, Green DN and Red DN, are the digital numbers of the green and red bands respectively. More information from the NGRDI here (https://link.springer.com/article/10.1007%2Fs11119-005-2324-5). Biomass is developed from organic materials, there are several methods to estimate biomass, one of them is remote sensing that allows estimating biomass according to the scale of the study area. There are satellite optical sensors (LANDSAT, MODIS) that have high resolution images (IKONOS AND QUICKBIRD), radar sensors or satellite microwaves (ERS, ENVISAT, PALSAR) or laser sensors (LIDAR), all these methods need field measurements to adjust the relationships that predict the biomass based on the observations of the sensors. Below is the image of the biomass in tons per hectare that could be mapped in the study area. The coefficient of determination of the NDVI and NGRDI is 0.89 and presents a better fit, unlike the ratio of the biomass with the NDVI (0.51) and NGRDI (0.44). Where the increase of positive NDVI and NGRDI values are associated with the presence of vegetation. The ratio of biomass and NDVI is stronger than that of NGRDI, which indicates that NGRDI is not as sensitive. The correlation observed between indices and biomass indicate that infrared images allow a better determination of crop biomass, allowing maps of yield and vigor of crops in the study area, since NIR bands provide more information on the characteristics Geometric crops and biophysical parameters such as the leaf area index, than the visual bands.